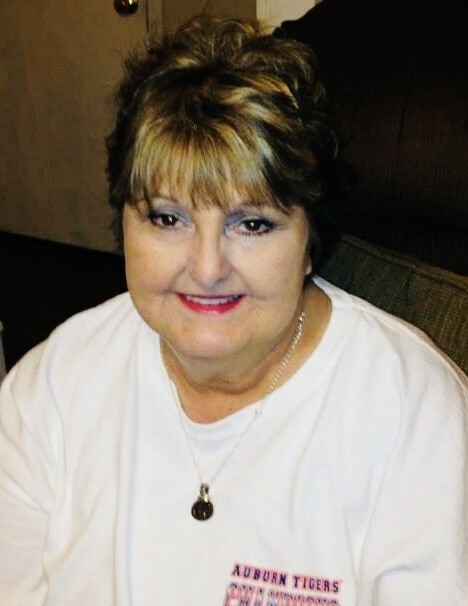 Mrs. Karen Clark Sims, 61, a resident of Valley, AL passed away Friday, September 14, 2018 at her residence. Funeral services will be held on Monday, September 17, 2018 at 11:00 AM EST from Johnson Brown-Service Funeral Home Chapel with Bro. Stephen Grubbs officiating. Burial will follow at Osanippa Cemetery. Visitation will be Sunday from 6:00 – 8:00 PM EST at the funeral home. Survivors include her husband, Dewayne Sims; daughter, Jessica Sims; son, Joshua Sims (Simone); grandchildren, Kyler Sims & Emmi Jones; brother, Gerald Clark (Lynn); sisters, Donna Stephens; & Linda Abbott (Ric); and brother-in-law, Stanley Sims. She was preceded in death by her parents, Earlene Lauderdale and Wilburn Clark; sister-in-law, Darlene Sims; and mother-in-law, Jackie Sims. Mrs. Sims was born on July 10, 1957 in Mobile, AL. Karen was the face in the window at Daniel’s Drive Inn for many years before her retirement. She missed her calling as a stand-up comedian, and always had a story that could have you in stitches. Her bubbly personality, wit, and fighting spirit always made her stand out! She never met a stranger or someone she couldn’t make laugh. Karen was the epitome of a loving wife, mother and friend. But her most treasured title was that of Memaw to her grandkids. She left this world with such dignity and grace. She will be dearly missed by all.